"I have called you not to the secular journey where you must make everything in your life now as pleasant as possible. I have called you to the spiritual journey, to a process of enlarging your heart to desire Me above everything else." And Sarah said, "God has made laughter for me; everyone who hears will laugh over me." And she said, "Who would have said to Abraham that Sarah would nurse children? Yet I have borne him a son in his old age." 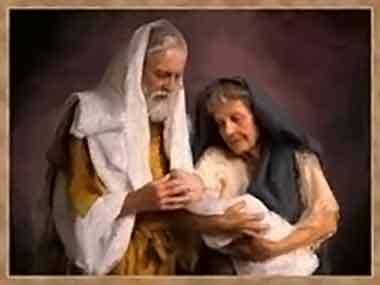 Finally, after all of the trials they have faced, Sarah has the son God has promised to her and Abraham, even though she was barren in her youth and must now be nearing 50 years of age. Sarah has just a bit of the smart aleck in her, for she laughed when God told her she would have a child. We know she eavesdropped on Abraham's conversation with the three men. Now that she has gotten reason for laughter and joy, she replies, basically, "yes, I have laughter in my life. Everyone is laughing at me." Throughout this all, though, she has carried the great sadness of being childless. She has hung for years onto God's promise of a great son, who will be the patriarch of a nation "numbered as grains of sand". Her faith has seen her through her ordeal.